The older Tom Cruise gets, the less time there is between his Mission: Impossible sequels. There was a mere four years between the first and second installments and it seemed that might be the end of things, but six years later when Tom Cruise needed a public face lift it was Ethan Hunt who was called on to come to the rescue. Five years passed and the series reinvigorated itself with Brad Bird's franchise-best, Ghost Protocol, and then four years passed before writer/director Christopher McQuarrie took over and teamed with Cruise to produce the worthy follow-up that was Rogue Nation. Now, only three years have passed between the last and what is now the sixth installment in this ever-expanding action franchise. I can only imagine that we'll have another Mission: Impossible movie by 2020 at which point Mr. Cruise will be fifty-eight years-old. It is not only Cruise's age that splinters the race against time these movies will become though, but also the fact the one-time biggest movie star on the planet is hard-pressed to find success elsewhere outside the franchise. This creates questions of what might Cruise do once he's no longer able to jump out of airplanes, scale mountains, or fly helicopters, but these are questions more curious than they are concerning. For now, audiences should simply revel in the fact Cruise can still accomplish what he has in order to bring FALLOUT to the biggest screen ever-which is where you should see it. Mission: Impossible - FALLOUT is the pinnacle of what it seems this entire series, knowing or unknowingly, has been leading to. It is McQuarrie's The Dark Knight, it is Cruise's commitment to celluloid that will define the middle act of his career, and it is by far one of the best action movies ever made. Yes, FALLOUT is everything a fan of the previous films could want in that it revolves around a convoluted plot of double crossings and inconspicuous baddies throwing obstacles at our beloved team of core heroes, but what elevates this latest entry above many of the others is the way in which it caps off this trilogy of sorts that began with Ghost Protocol where these movies weren't just using Cruise's Hunt as a conduit for action or trying to humanize him, but more discover the person Hunt actually is while detailing his journey to figure out who he truly wants to be. FALLOUT is as much a coming to terms and peace with who the character is for Ethan Hunt as it is a clarification on the haze that still tinged who Hunt was over the last few films. How this will affect future installments will remain to be seen, but as the core of FALLOUT it only adds substantial weight to a movie that excels in every other facet of the genre it is excited to exist within. 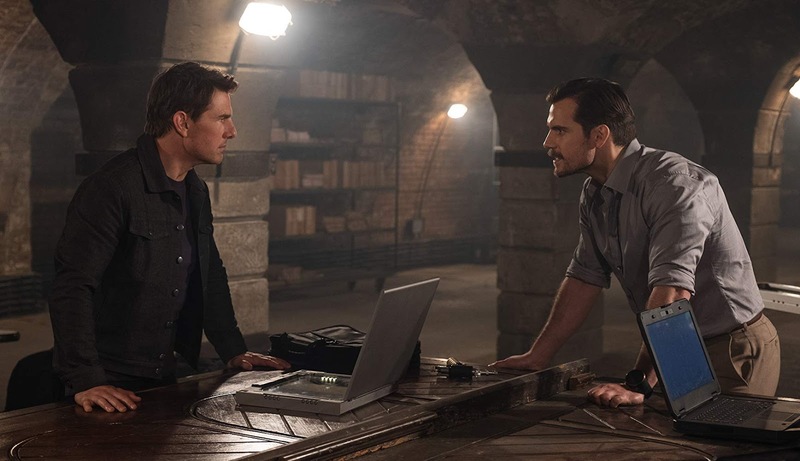 IMF Agent Ethan Hunt (Tom Cruise) and CIA Operative August Walker (Henry Cavill) are reluctantly paired up on their latest mission. While it has been three years since Rogue Nation in real time it has only been two in the lives of IMF agent Hunt and his team who have been tasked with tracking down a sub-group of Solomon Lane's (Sean Harris) Syndicate that call themselves The Apostles and are led by a mystery man named John Lark. 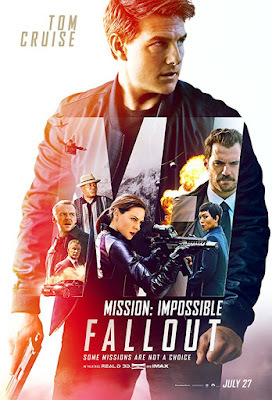 It seems the current objective of these "apostles" is to begin nuclear war so as to reset the human race (which has now been the plot of at least two of these movies), but in this instance in particular Hunt, Benji (Simon Pegg), and Luther (Ving Rhames) are attempting to recover three plutonium cores that have been stolen by the terrorist group. It is when Hunt chooses to save Luther's life over securing the plutonium that the entirety of this revealing journey Hunt is about to go on begins. After essentially failing the mission, but saving his entire team Hunt is given orders from new IMF director Alan Hunley (Alec Baldwin) that provides insight into how Hunt and his team might retake the plutonium. This is not before Angela Bassett's CIA Director, Erica Sloane, instructs Hunt and Hunley that Special Activities operative August Walker (Henry Cavill), who has a reputation for being something of a blunt instrument, will be shadowing Hunt on the mission. Hunt is naturally reluctant, but is given little choice and so he and Walker take off for Paris as they will have to HALO jump into the City of Lights in order to infiltrate a night club where they are to meet an arms dealer called The White Widow (Vanessa Kirby). If you've seen any of the previous Mission: Impossible films then you'll know these plans don't always go according to...well, plan. This is what makes each of the set pieces so gleefully exciting and simultaneously nerve-inducing. Not only are they each executed with a craft beyond anything else we're seeing in the movies today, but they take into account the fact they're still occurring within a movie and are sure to add little moments of truth and humor; sometimes all it takes is a facial expression from Cruise to remind us of the magnitude. This sense of great wonder combined with white-knuckle tension is prevalent from the word go as the HALO jump is the first of many grand action sequences FALLOUT delivers. It's not just the big spectacle stunts that thrill though, as a bathroom brawl involving Hunt, Walker, and a third party the two are trying to intercept before he meets with White Widow that takes place shortly after they drop into Paris is one of the most exhilarating hand to hand combat scenes in recent memory (I know, I need to watch The Raid). It is at this point in the narrative that FALLOUT takes something of an interesting and rather unexpected turn as it has characters dictate leads and place assumptions in the audiences minds that add facets never before considered and while we ultimately know Cruise and Co. will accomplish the mission and be successful that we are made to genuinely question this at all is a true achievement. FALLOUT achieves this several times. And so, as less time has passed in the world of the film than in our world and given this coupled with the fact this is the shortest interim between M:I films in either the real or fictional world of the movies this also gives way to the fact Rogue Nation and FALLOUT are the two most connected of the series thus far. This may also have something to do with the fact McQuarrie is the first director to helm more than a single entry in the series as, prior to Rogue Nation, each film had somewhat existed as an example of the many ways in which one could construct an action flick as done by a rogues' gallery of notable filmmakers. And while, by nature of the beast, the Mission: Impossible series might have come to be more of an inclusive and/or interconnected franchise a la The Fast and the Furious anyway it is likely to the benefit of the series that it was ushered into the current cinematic climate via a single visionary. McQuarrie, who came to prominence as a writer on The Usual Suspects and first directed Cruise in Jack Reacher has figured out not only how to string together large set pieces with expert precision, but has also tapped into the reasoning behind it all as well as the layers that exist within the multiple factions always gunning for the same objective. McQuarrie has created more of a shaded world instead of distinctly drawing the line between the good and the bad. He does this most overtly through Rebecca Ferguson's Ilsa Faust. Faust is a character who had to play the role of a double agent in Rogue Nation and yet Hunt never looked at her as the enemy simply because they stood on two opposing sides of the same target. Rather, this budding relationship served as McQuarrie's way to begin peeling back the layers that were inevitable in a franchise that began in a rather simple and straightforward fashion meaning more as a genre exercise than as an innovative piece of art, but that has continued to grow over the many installments and twenty-two years it's now been around. There would inevitably come a time when the formula of stopping a bad guy from stealing something in order to do something very bad through the process of outlandish action sequences, party infiltrations, disguises, and motorcycle chases just wasn't going to suffice and FALLOUT thrives because McQuarrie still includes all of these keystones, but builds upon that now present history to explore deeper themes and darker avenues. That and the aforementioned Dark Knight comparison isn't to say McQuarrie's film is the dark and gritty version of an M:I movie as there are plenty of chuckles to be had in FALLOUT, but more to say these movies still take themselves seriously. McQuarrie allows the outcomes of each of the scenarios our characters find themselves in to be driven by the choices the characters make rather than due to that of a certain point the story needs to hit. It's about character and in FALLOUT, it's first and foremost about the moral character of Ethan Hunt and how such is both demonstrated and upheld. Ethan Hunt is back to his old tricks in one of his biggest missions yet in Mission: Impossible - FALLOUT. 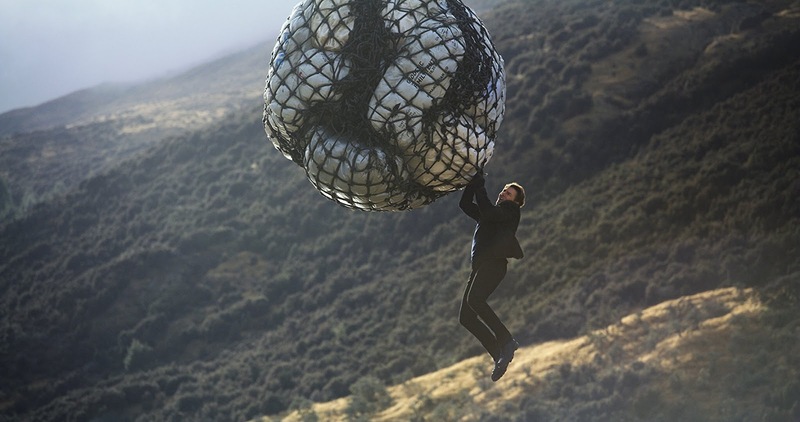 Mission: Impossible - FALLOUT is the pure definition of entertainment. Besides the heavier stuff that adds the necessary and rewarding dramatic weight there are of course the numerous, terrific set-pieces. Having already mentioned the HALO jump and Parisian bathroom brawl it should be noted that those sequences take place in the first act of the movie and Cruise is only beginning to get warmed up. The set piece following that of the not one, but two hand to hand combat scenes in the night club though quickly differs itself from what has come to pass already by beginning to emphasize that character stance as discussed in the previous paragraph. Whereas the fight scene in the bathroom is completely devoid of a score or soundtrack and more visceral for it due to McQuarrie and his sound designer letting us feel every blow and crunch the following sequence featuring Cruise and Cavill foiling a rescue operation is set completely to that of an orchestral score and has us unknowingly follow the protagonist until it reaches a point that, if revealed to be Hunt, the choice he has to make would be one that would make or break the character for many. McQuarrie isn't squeamish about showing us the victim's face. He wants to highlight how difficult it should be for any given human to take the life of another human and he doesn't let anyone off easy. This cacophony of the symphony, the violence, and the moral dilemmas crescendos with a motorcycle chase through the streets of Paris that is as insane and as fast-paced as anything in the entire franchise and we all know how much Cruise loves his motorcycles. The fact all of this is done in as practical a method as possible lends the aesthetic a more chilling dimension as it almost feels as if we're watching it live and in real life and that something could actually go wrong at any given moment. This is all in preparation for the climactic stunt in the film which includes a helicopter on helicopter chase through treacherous, but breathtaking landscapes, a fire fight in the sky, and some bomb disarming for good measure that is shot completely in IMAX and will literally push you either all the way to the back of your seat or right off the front of it. McQuarrie's clear direction, some nicely placed humor, and a fantastic ensemble cast all mesh into a dazzling apex of spectacle. Cavill is of special note among the ensemble as his Agent Walker is a wall of brute force and charisma. After having seen Cavill have to play so restrained in his Superman role, but shown a strong indication of what he was capable of in 2015's Man from U.N.C.L.E. it is refreshing to see the guy have an opportunity to really dig into a juicy role that not only allows him to give a more diverse performance, but also utilizes his god-like physicality to its full potential. The bathroom scene in particular is where Cavill shines brightest as one can feel the sheer power he's exuding come through the screen. It should also be noted that Harris' villain is utilized in different ways than might be expected, but is effective in his role in the story and how it weaves together with the overarching needs and desires of the other characters involved. Harris has a classic menace to him that reverberates throughout any scene he chooses to look down upon; leaves an impact on the proceedings and helping to reinforce the grave tone of the film. It's a tricky deal to pull off in films like this where the villain can be the most disposable part when it should be what makes the hero so heroic, but having established Lane in Rogue Nation as a formidable foe and having consequences of being the kind of man McQuarrie want to emphasize Ethan Hunt is come back around to bite him gives this greater sense of both personal responsibility and peril. Speaking of personal responsibility, the inclusion of Michelle Monaghan's Julia here, a remnant of a series lost in limbo, is handled as well as could be expected creating some potently emotional moments that feel inherently natural to Hunt's story and evolution. This is still very much a Tom Cruise vehicle though, and maybe the most stunning aspect of all of FALLOUT is the fact that amid everything else going on it is still about who the man at the core of these movies is and why he continues to save the world. In one of the film's more tender moments featuring series veteran Rhames there occurs an exchange of dialogue that might be a little too on the nose for some, but ultimately feels necessary in reminding us that Hunt is a man among men and, in regards to our current cinematic landscape, a veritable hero among super heroes.